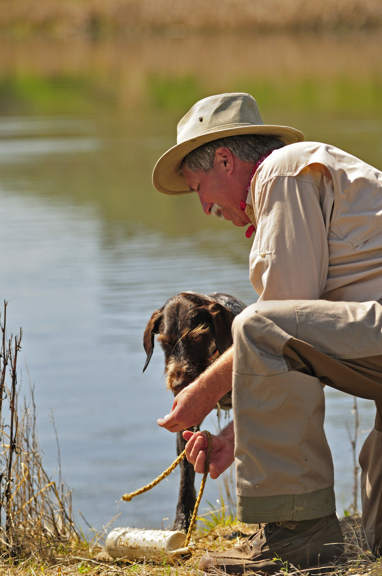 Cross “Dog Whisperer” with “A River Runs Through It,” add shotguns, beautiful places and the camaraderie of the hunt and you’ve got the definitive show on the subject … by passionate participants, for them. Wingshooting USA focuses on the FUN of this great sport and (finally!) honors the dogs that make it all possible. Scott Linden has created a TV show that authentically portrays the upland hunt, from exciting dog work to hunting action … hits and misses and the camaraderie of good friends in the field. Useful tips and advice ensure you’ll become a better shooter, dog owner and bird hunter … and it’s all offered in an entertaining, engaging style unique to Scott’s shows. If you liked Scott’s “What the Dogs Taught Me,” or “Cast & Blast,” you’ll love Wingshooting USA. Spectacular locales, canine athletes doing their best, and a minimum of gab … it’s no wonder Wingshooting USA has been voted “favorite upland show” two years running in a national survey. You can also win prizes and trips while helping six great groups raise funds in the exclusive Wingshooting USA initiative “TruckVault Cares … for conservation, canines & kids” … or win a hunting trip and chance to be on the show in the “Take Your Friend Hunting” sweepstakes … all while enjoying the best in upland hunting across the country. Wingshooting USA host Scott Linden was named “favorite host” in a nationwide survey of over 800 wingshooters and dog owners. Producer-host Linden focuses on the “good stuff,” literally and figuratively: lots of dog work, habitat and birds, advice and instruction, strategy and tactics. It’s equal parts adrenaline rush and insights into the dogs that fuel it, from an award-winning producer who is passionate about dogs, birds and the people who chase them. Innovative production puts you “on the ground,” with the birds as they’re pinned by a trembling shorthair … or in the air as they flush before the gun! “By offering an easily searchable online database of upland hunting preserves, www.wingshootingusa.org, is helping to connect hunters with great hunting opportunities and is helping increase hunting participation,” Miles added. The show always features a variety of people, places and dog breeds. From Idaho to Montana to North Dakota and South Dakota, Oregon and California, the hunting challenges and terrain will vary as much as your own hunting. Dog breeds? Yah, we got ’em. Shorthairs, Irish Red Setters, even a lab or two among the pointers and versatile breeds just to mix it up. And of course, Scott’s own German wirehaired pointer, Buddy will be there. Friends new and old join Scott in a variety of coverts from cut corn to milo, shelterbelts to desert sage. Tactics change and dogs excel (or not!) as they rise to the challenges of varying terrain. You’re invited along on hunts for ringnecks, bobwhites, Hungarian partridge and sharptail grouse. Valley quail might even make the cut … if we can hit any of them! Looking for a place to hunt? Visit www.wingshootingusa.org! Wingshooting USA is the National Shooting Sports Foundation’s effort to boost bird hunting participation. Hunters can visit www.wingshootingusa.org and easily find nearby hunting preserves, lodges and outfitters with the click of a mouse. Tips and advice in written and video form are also available at the site. If you are interested in sponsoring the definitive wingshooting and bird dog show, contact us at 541-382-1726.